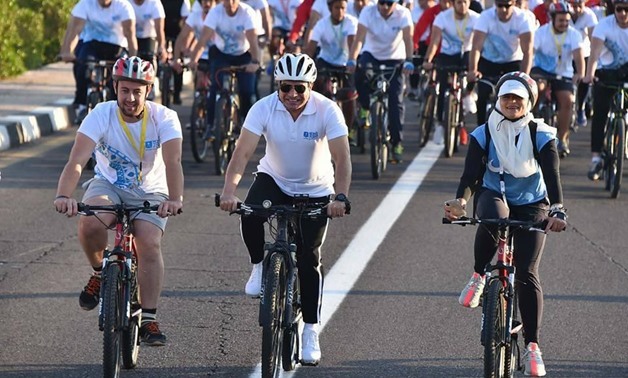 Sisi participates with youth in WYF’s ‘peace’ bike marathon Photo credit: Egypt Today. Earlier last week, Egypt’s President Abdel Fattah Al-Sisi commented about Egypt’s obesity rate leaving room for trolls to mock his commentary through memes that have circulated social media. This was the second time the president emphasizes on the obesity epidemic that has been taking over Egypt. During a conference on 15 December, Egypt’s Minister of Health revealed new data on Egyptians’ average weight. Upon hearing the statistics, Al-Sisi questioned the audience “why are we doing this to ourselves?” He then emphasized the importance of exercise and a healthy lifestyle for about 20 minutes. Egypt’s new Hepatitis C campaign, which was an initiative by President Sisi, measures the height and weight of patients. Almost 13 million out of the 17 million who were checked were overweight, the minister highlighted. According to a recent study by the World Health Organization (WHO), around 63 percent of Egyptians are overweight, 36 percent of which are obese. This rate is the one of the highest in the world. Egypt’s president has been known to be an advocate for healthy lifestyle. He was spotted repeatedly on his bike around the city. Earlier in November during the World Youth Conference, Al-Sisi said that a large number of students were overweight. This comment too sparked backlash on social media. “Most will understandably see the president’s comments about the importance of losing weight as a way of deflecting concerns about the dramatic pace of inflation,” Timothy Kaldas, a non-resident fellow at the Tahrir Institute for Middle East Policy told Egypt Independent.